On November 5, the Seminar on Opening up and Globalization & Book Presentation Ceremony of Breaking Through was held at Millennium Hotel London. 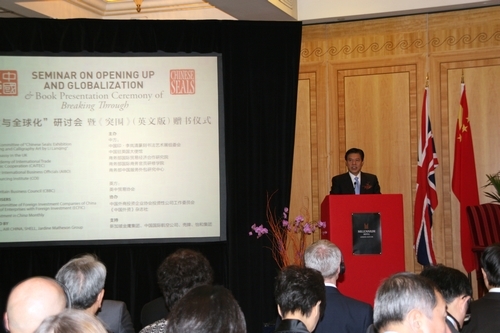 The event was jointly hosted by the Organizing Committee of the Exhibition “Contemporary Chinese Seals by Li Langqing”, the Chinese Embassy in the UK, the International Trade and Economic Cooperation Research Institute of the Chinese Ministry of Commerce, China Service Outsourcing Research Center, the Academy for International Business Officials of the Chinese Ministry of Commerce and China-Britain Business Council (CBBC). It was co-sponsored by the Executive Committee of Foreign Investment Companies, China Association of Enterprises with Foreign Investment and the Foreign Investment in China magazine. Over 200 representatives from the Chinese and British governments and business communities attended the seminar. The theme of the Seminar was China’s reform and opening up and the world economic development. Chinese Vice Minister of Commerce Zhong Shan and British Permanent Secretary of the Department for Business, Innovation and Skills Martin Donnelly delivered a keynote speech at the seminar, and Cong Peiwu, Charge D’affaires of the Chinese Embassy, read the congratulatory message of the Ambassador Liu Xiaoming. Vice Minister Zhong Shan said in his speech that with 30 years of opening up, China has achieved a rapid development in economy. It has built a multi-faceted and multi-tiered opening-up pattern and an open economic system with Chinese characteristics. The opening-up makes possible the interdependence and deep interactions between Chinese economy and the world economy, drives technological advances and helps China to speed up its process of industrialization and modernization. The practice has fully proved that China’s opening up policy is completely correct. The UK is an important partner of China in Europe, and the sound bilateral trade and economic relations are in the common interests of both countries. Faced with new challenges, China and the UK should further deepen the bilateral trade and economic cooperation and seek new breakthroughs in more extensive areas and at a higher level. Mr. Li Lanqing’ book Break Through truly reproduces the magnificent course of China’s opening up to the outside world. It shows the extraordinary courage and strategic thinking of the Chinese leaders in making the strategic choices at a critical juncture in the history, and reveals the historical inevitability of China’s opening up. Ambassador Liu pointed out in his congratulatory message that China has made remarkable achievements in economic and social development during the over 30 years of reform and opening up. Mr. Li Lanqing is a witness, participant, implementer, leader and decision-maker of the 30 years of reform and opening up in China. In his book Break Through, Mr. Li recalls the major events at the initial stage of China’s opening up to the outside world with his own knowledge and experience and reproduces this soul-stirring process of great exploration and practice. This book is a must for the Western scholars, entrepreneurs and statesmen who are interested in understanding China’s process of reform and opening up. It is a good book worth recommendation. Martin Donnelly, British Permanent Secretary of the Department for Business, Innovation and Skills, said that in the more than 30 years of China’s reform and opening up, the UK and China have become true partners, and the two countries have established win-win business, trade and investment patterns on the basis of mutual trust. The British Government welcomes more cooperation projects between Chinese enterprises and the UK, and the two sides can also carry out more extensive exchanges in education, scientific researches and other fields. CBBC Chairman Sir David Brewer, Adam Williams, Chief Representative of Jardine Matheson (China) Co., Ltd., Lim Haw Kuang, Executive Chairman of Shell Companies in China, Huo Jianguo, President of the Research Institute of the Ministry of Commerce, Jin Xu, President of the Academy for International Business Officials of the Ministry of Commerce, and other representatives participated in the interactive discussions at the seminar, talked about their personal experience of the great changes brought to China’s economy by the reform and opening up and answered questions on scene. Vice Minister Zhong Shan and Charge D’affaires Cong Peiwu presented Mr. Li Lanqing’s book Break Through to CBBC, UK Trade & Investment, University of Oxford, the British Library, Golden Eagle Group, Jardine Matheson (China) Co., Ltd., Shell Companies China and representatives of the Chinese business community at the seminar.